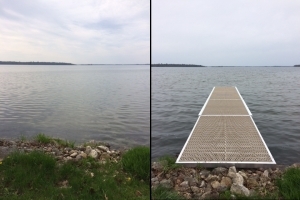 Just wanted to share our before and after photos with our new dock! We are so very happy with the dock system! The ease ofinstallation, and quality of construction are amazing. We especially like the ThruFlow decking, not only is it maintenance free, but the geese and ducks do not seem to like “resting” on it, so, no messes to clean up every morning! We are already planning an expansion of the dock, and the addition of some accessories, we will be in touch! Thank you for your help in guiding us to this dock, the designer series is well worth the price.